Successful completion of the installation depends upon the correct management of the contractual interfaces between customer, installer and all third parties. From the installer’s point of view the possible interfaces are where the customer or a third party. Two primary causes of the malfunction or non-function of a fibre optic transmission link lie within either the transmission equipment or the cabling. – The cabling can only fail because of insufficient bandwidth or excessive attenuation; In practice the bandwidth of the installed cabling is unlikely to change and failure may be traced to attenuation at demountable connectors, joints or within the cables themselves. The installer therefore is able to quantify the performance of the installed cabling at the time of installation and at any time thereafter. – Transmission equipment, however, can fail for a variety of reasons ranging from blown fuses to corrupted electro-optic signals being generated, and in general these causes are well beyond the capability of the installer to detect and rectify without specialist training. If the customer has a specific application for the data highway and does not intend to upgrade, expand and evolve the services offered, then the systems integrator may be very successful in providing the correct solution. However, if the cabling is intended to support a range of equipment and services over its lifetime, then it may not be in the best commercial interest of the customer to use a system integration approach, since the customer may desire the highway to be warranted and maintained separately from the transmission equipment. For this reason it may be contracted to provide a fibre optic cabling infrastructure as a stand-alone item. In this case the equipment supplier will be charged with the task of providing a transmission link across an installed cabling network for which a bandwidth and attenuation have been defined within a specification agreement. – jointing and testing of laid cabling components and accessories. Once installed the highway must undergo final acceptance testing and then be fully documented. In virtually every case the civil engineering works and cable laying practices are the same as should be undertaken for good-quality copper cabling. extent is representative of a typical application without actually mimicking any particular one. A large installation could comprise long external cabling routes between buildings and shorter routes within buildings. The external routes might be a combination of duct routes, catenary, aerial and wall-mounted sections whilst the internal links might consist of both vertical (riser) cabling together with horizontal (floor) cabling. 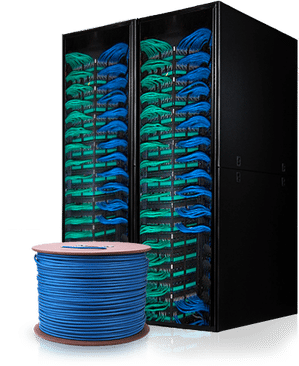 The installation might require the provision of complete equipment cabinets or may just define the installation of fibre optic termination enclosures into existing cabinets. The customer may wish to place separate contracts for the civil engineering aspects, where new ducts have to be installed, the cable installation and the final fibre optic works (jointing, testing and commissioning). The flexibility of this approach is a reflection on the non-specialist nature of all the work with the exception of the final fibre optic content. The customer may wish to purchase the fibre optic components directly rather than incur the expense of working through the installer. In many cases this is quite acceptable to the installer; however, the customer always runs a greater contractual risk and acceptance testing is vital. The role of the fibre optic installer can therefore be limited to the termination, testing, jointing, documentation and maintenance of the fibre optic cabling rather than the other non-specialist tasks. As a result the choice of a prime contractor rarely needs to take the transmission technology into account and a commonsense approach should be taken. Fixed cables may have been pre-purchased by the customer or third parties on behalf of the customer. Alternatively the installer may be asked to extend an already installed system. In these circumstances the installer cannot be held responsible for the condition of the fixed cable but should take steps to ensure that it meets the original specification to which it was purchased in accordance with the relevant testing. However, the most important issue is the compatibility of the fixed cable with the components to be supplied by the installer to which it is to be jointed or connected. Incompatibility may be seen as difficulty in jointing or excessive attenuation levels (different kinds of optical fibre may be involved) at joint or demountable connections, and could render the installer liable since the agreed specifications could not be achieved. It is therefore vital for the installer to ensure, as far as possible, that all components are compatible and can be processed in accordance with the specification.When fusion splice techniques are to be used it is wise to ensure that effective jointing can take place and the relevant equipment settings should be established. for the installer to ensure that all the components supplied by the customer or a third party are to be consistent throughout the installation. For instance, it has been known for a third party to cut costs by supplying adaptors from a different manufacturer than the connectors supplied on pigtailed, patch or jumper cable assemblies by the installer. When this occurs the installer must highlight, at the earliest possible stage, that the specification may be compromised. It is also vital to ensure that connector components provided to the installer are complete and that all accessories such as dust caps, washers etc. are available and functional. This can be important since patching fields without dust caps can result in contaminated connector end-faces which may become the installer’s responsibility. Absence of the correct washers on adaptors may result in their coming loose from the patching field and potentially affecting the attenuation of the connection made. Where the installer is provided with cable assemblies it is vital to ensure their compatibility with the other cabling components to be supplied. Obvious checks relating to fibre geometry and connector style must be underpinned with acceptance tests for insertion loss against fibre typical of that used within the chosen fixed cable designs. In addition pigtailed cable assemblies should be checked for ‘jointability’ against the fixed cable, and where fusion splice techniques are to be used the equipment settings should be established. for the adaptors to be fitted (in terms of thickness of the panel, the washers and fixing methods supplied). It is quite common for the termination enclosures to be mounted inside existing cabinets. This is particularly true for 19-inch rack type systems. The installer should ensure that the cable management used within the cabinet is not fouled when the cabinets are closed and locked. This may necessitate the use of recessing brackets. It is normally the installer’s responsibility to provide such accessories and their necessity should be established at the earliest possible time. When existing cabling is to be extended it is likely that documentation exists for the installed cabling. Experience has shown that, unless the customer has been fully committed to the upkeep of such information, changes may have been made which are not recorded within that documentation. This is perhaps the most important area in which nothing can be taken on trust and it is the responsibility of the installer to ensure the correctness of the documentation provided by undertaking a sample survey. If for any reason doubts exist, then a full survey must be undertaken prior to the installation commencing. The implications of accepting faulty documentation can be disastrous and can not only impact just the current installation but can seriously affect the operation of the existing networked services. The typical installation will comprise procurement of components, undertaking of civil engineering works, cable laying, jointing and commissioning and, finally, documentation of the task performed. In the majority of cases the critical path item is the fixed cable or cables. Most of the other items to be used within an installation will be comparatively readily available (unless some of the more complex military style connectors are used). Because there are few standard designs and few standard requirements it is not uncommon for the ideal cable to be unavailable ‘off the shelf’ and there are two options open to the customer and installer. Either a custom-built design is chosen for which the delivery may be extended or a compromise may be found where a cable of the correct physical parameters is purchased ex-stock, but perhaps the fibre count is in excess of the requirement. Fixed cable can represent a considerable investment. This factor linked to potential difficulties in procurement places great emphasis on purchasing sufficient to allow for contingencies. Once purchased the value of testing the cable at all contractual interfaces cannot be underestimated. are of an intermatable design. Full insertion loss and, where relevant, return loss measurements shall be recorded with the goods provided. It is also desirable to agree visual inspection standards and, where necessary, environmental testing levels with the manufacturer of the cable assemblies. Termination enclosures should be assessed for compatibility with the chosen location and when cabinets are to be used to house the termination enclosures, the fixing methods should be established. Also the cable management arrangements outside the enclosures must be checked for compliance with the specification.